In an attempt to determine the timing and possible environmental influences for diversity changes in the terrestrial and freshwater molluscan fauna of the central Great Plains, Miller (1975) analyzed the species abundances, distributions and habitat tolerances of a series of radiocarbon-dated fossil mollusc assemblages from southwestern Kansas and northwestern Oklahoma. He examined seven assemblages ranging in time from about 30,000 – 10,500 radiocarbon years ago. (In the present paper an assemblage, or local fauna (l.f.), and the site name from which the specimens were collected are used synonymously.) During the summers of 2004-5, the authors sampled three of these localities, Bird, Boyd and Classen, for rodent fossils as part of the Meade Basin Rodent Project, a long-term study designed to examine the history of rodent biodiversity in southwestern Kansas and northwestern Oklahoma (Martin et al. 2000; 2002, 2003; Pel�ez-Campomanes and Martin 2005; Honey et al. 2005). The zones we sampled at the Bird and Boyd localities produced meager fossils, but we discovered a very rich layer for small mammals in the outcrop that produced Miller's Classen molluscan fauna. In order to avoid confusion with the Classen faunule of the Jones l.f. (Davis 1987) we here rename Miller's Classen l.f. the Golliher l.f. in honor of the current owners of the property. The organismal assemblage we report here is referred to as the Golliher B local fauna, taken from a thin stratum above the layer of Miller's molluscan sample, the latter which will be known as the Golliher A l.f. (Figure 1). 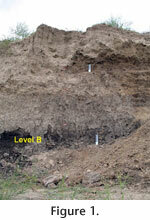 Stratigraphy of the Sand Creek section producing the fossils is described below. In addition to the stratigraphy, we will present a rodent species list from level B in the Golliher section and argue that some indicate an intense cold period near the end of the Pleistocene. An ancillary examination of variation in the crown pattern morphology of meadow vole molars from Golliher B shows that the modern crown morphology pattern in M. pennsylvanicus developed in a remarkably brief period of time during the late Pleistocene.